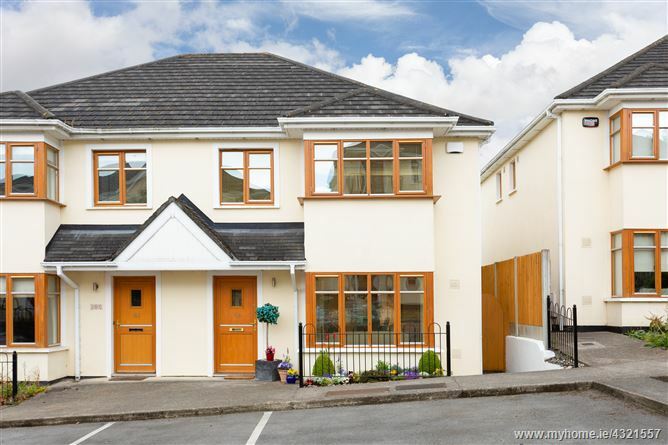 A stunning modern four bedroom semi-detached family home in showhouse condition with an inviting, smart, interior designed layout which has been extremely well maintained and tastefully upgraded to include an extended kitchen area and landscaped rear garden with patio and suntrap area overlooking mature trees all tucked away in a private choice cul de sac location within walking distance of Stepaside Village with parking to front. The Rectory, built by Albany Homes in 2007, is an exclusive, upmarket mixed development of houses and own door apartments set in 8 acres of mature trees and landscaped parkland beside Kilgobbin High Cross national monument, Kilgobbin Church and Kilgobbin Castle and set off the Enniskerry Road, within walking distance of Stepaside Village with it's expanding range of neighbourhood services including the famous Step Inn pub and Morgan & Max restaurant, local Centra and Post Office and a choice selection of food retail and service outlets and is also convenient to Leopardstown Shopping Centre with Dunnes Stores. Dundrum Town Centre and village with its choice of major retail stores, cinema, theatre, restaurants and bars are also close by. There are also a choice of excellent schools and churches in the vicinity. Sandyford Industrial Estate, The Beacon Hospital, Beacon Hotel and Beacon South Quarter Shopping Centre are all conveniently located as is Central Park, and Carrickmines Retail Park. The area has a large selection of south Dublin’s best schools including two Gaelscoils, Educate together, Kilternan Church of Ireland, Our Lady’s of the Wayside as well as Rosemount Girls Secondary School. There are excellent public transport facilities available nearby including a regular bus service which serves the N11, Dundrum, University College Dublin and the City Centre. Both the LUAS and the M50 are easily accessible.